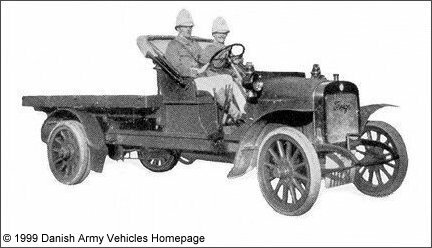 Danish Army Specific: The picture shows a Thrige Truck model 1914, serving the Danish Army at the Virgin Islands. Historical: The first car to be produced by Thrige in 1909 was electrical driven, but did´nt perform well, and the next car shown in 1910 was powered by a Ballot petrol engine. Later Daimler engines were used. The truck and bus range was powered by either Ballot or White & Poppe engines. The Thrige factory in Odense produced cars, busses and trucks from 1909 until 1918 when it merged with Anglo Dane and Jan into "De forenede Automobilfabrikker" ("United Car Factories").